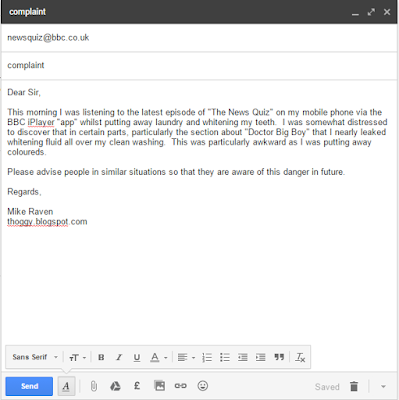 I was so incensed the other day that I was forced to fire off an email to "The News Quiz", a popular BBC Radio 4 show. 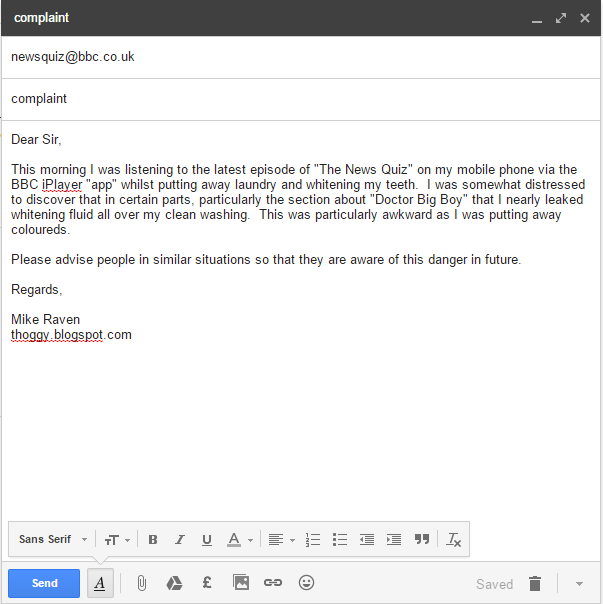 See the email sent below. This morning I was listening to the latest episode of "The News Quiz" on my mobile phone via the BBC iPlayer "app" whilst putting away laundry and whitening my teeth. I was somewhat distressed to discover that in certain parts, particularly the section about "Doctor Big Boy" that I nearly leaked whitening fluid all over my clean washing. This was particularly awkward as I was putting away coloureds. Please advise people in similar situations so that they are aware of this danger in future.